Arthurise has been hit by a highly infectious disease called Venen. It affects only women, killing those who contract it within six days. Jonathan Gouden and his father, the esteemed scientist Dr. Heinrich Gouden, have been asked by King Edward to assist Lady Florel (“the empire’s top medical scientist”) in finding a cure. With more and more women becoming infected every day, time is of the essence. Lady Florel insists in the use of fantillium (a drug that causes one to be able to spin illusions), to aid in the endeavor. After a test of said fantillium Dr. Gouden is firmly against it, citing that Lady Florel no longer appears to be the Lady Florel (she’s smiling entirely too much). When both Jonathan’s mother and sister contract the Venen he takes it upon himself to experiment with the fantillium and finds he has quite the talent for illusioning. When Lady Florel discovers Jonathan can weave illusions, she promises him the antidote to the Venen, but it comes at a price. Jonathan will agree to anything to save his family, and before he knows it, he’s taken through an illusioned door to Nod’ol, the crumbling opposite of the illustrious Arthurise. Now, not only does Jonathan have to find a cure, but he also has to find his way home again. Illusionarium has probably been one of the more visually accessible books I’ve read in awhile. 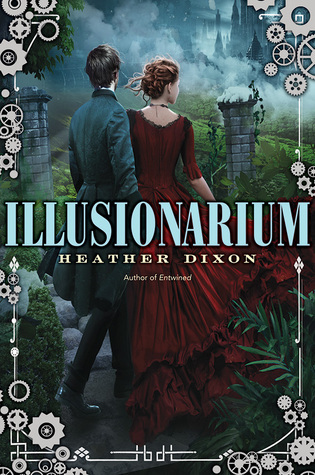 Much of the book is based in either illusion or in a topsy-turvy world (heck, even what is considered the “real world” in Illusionarium is an alternate 19th century London). Oftentimes, reading something so metaphysical, I find, I get lost in descriptions sometimes not really being able to correctly picture it in my mind while reading. That doesn’t happen here. Heather Dixon weaved together her worlds excellently. Of course, this means the beautiful as well as the grotesque aspects. For the people of Nod’ol their days are filled with the deterioration around them. So they escape by constantly living in illusions. Thus, they turn into things called Riven where they literally begin to fracture and grow extra appendages (mainly eyes and sets of teeth) over various parts of their bodies. They are images in my mind I won’t soon forget (and you’re welcome for me passing them along to you). 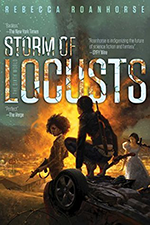 It wasn’t something that I was expecting when I began reading, and while slightly disturbing, I have to hand it to Heather Dixon’s imagination. Another thing I liked about Illusionarium is the fact that there is no romance. Jonathan is sixteen. He’s getting ready to go to university. Illusionarium focuses on Jonathan’s journey from a “sort of” person—“sort of tall, sort of thin, sort of brownish hair”—to an “absolute” person. He begins to stand out on his own. I enjoyed seeing him grow. To push Jonathan along on his journey is Lockwood, a Lieutenant in the Arthurise guard. 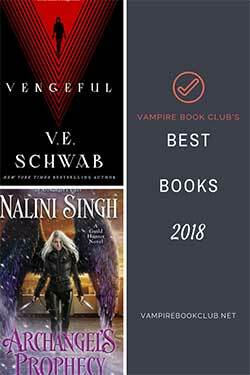 They are complete opposites, and their bickering throughout the book made for some much needed humor, but the tentative friendship they form is something I haven’t read much lately in the books I’ve read, and I found it a refreshing change of pace. Overall, I found Illusionarium to be unique and somewhat unexpected. Definitely going to keep Heather Dixon in mind for future reads.